The phone line crackles out of Seoul where it’s nearly midnight, and where RM, the leader of seven member South Korean group BTS, is looking back at a crazy month in which they broke records – some their own, some they never even thought they’d achieve – one after the other in a relentless wave. “I feel like we’re a balloon…,” RM says, surmising the time period, and there’s a tinge of disbelief in his voice. 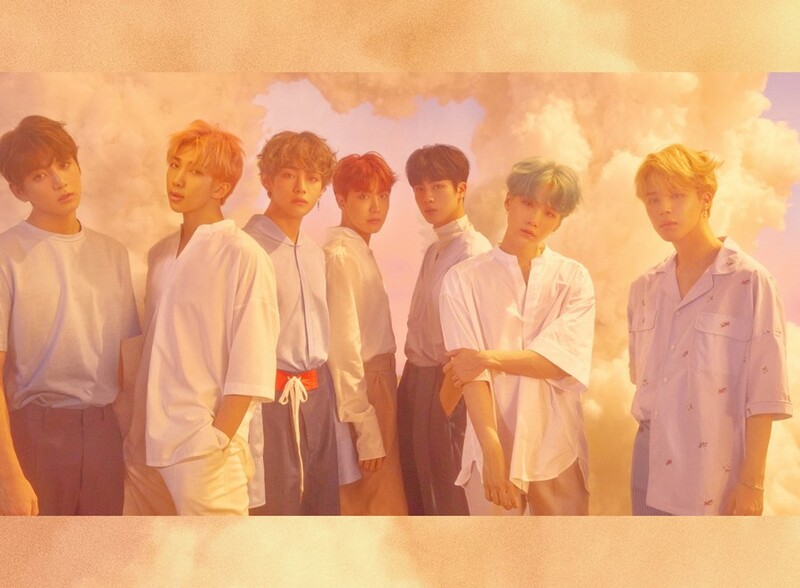 That’s unsurprising given their latest mini-album Love Yourself: Her is the biggest selling K-Pop album in pre-orders ever (over a million in domestic alone), and with the lead single “DNA”, they’re now the fastest K-Pop group to hit 10 million, 20 million, then 100 million YouTube views. 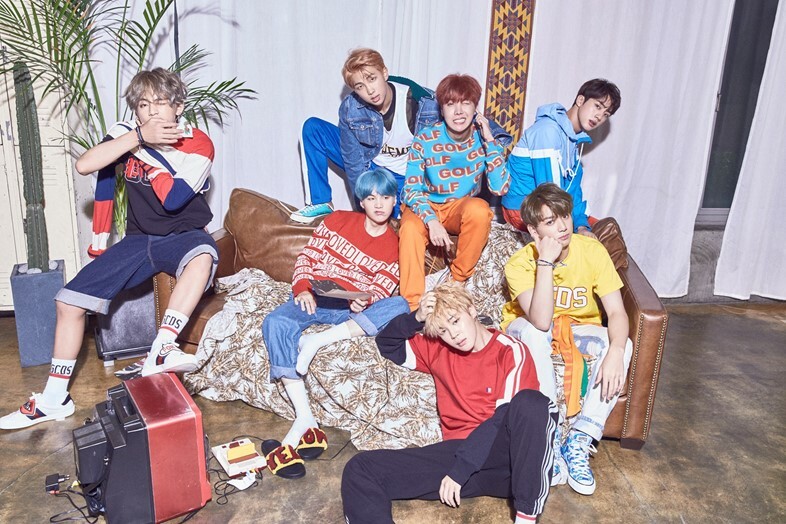 Then there are those killer chart standings – #14 on the UK album chart, top 10 on the US Billboard 200 album chart – while DNA not only reigned over worldwide iTunes charts but rose to #67 on the Billboard Hot 100, the highest position ever for a Korean group. Expectations had, naturally, run high for their comeback; BTS (rappers RM, J-Hope, Suga, and vocalists Jimin, Jin, V and Jungkook) reached ‘phenomenon’ level last year with their second studio album WINGS and moombahton-style single Blood Sweat & Tears, yet 2017 has already provided an almost unbelievable new layer of success. Every day now brings another milestone, another article or another Western radio station playing the frisky, echoing electro-pop of “DNA”, adding to the feverish atmosphere around them. If their powerhouse fandom, known as A.R.M.Y, even felt momentarily overwhelmed by it all, then they’re not alone. Over the weeks since its mid-September release, pre-empted by a series of trailers bridging from the previous concept for the The Most Beautiful Moment In Life double album, Love Yourself: Her became trickier the more time you spent with it. Saturated in double entendre (both an exploration of love and a direct letter to their fans), its sound, for the most part, strides in a confident, glossy groove, yet peel back its shimmery surface and bruises and scratches lie along its limbs, even on the sweetest of tracks such as “Serendipity”. While it’s not often that you get to step into an album’s lifecycle where hindsight begins to glimmer and perhaps shape an artist’s next phase, it’s a curious, illuminating and slightly vulnerable experience. But, without a trace of hesitation, we dive into Love Yourself: Her to explore the parts instantly indoctrinated into BTS lore, its impact, shadows and the wider reaching effect on its owners. On release you called Love Yourself: Her a ‘turning point’ and BTS’s ‘chapter two’, pointing at the music as the primary cause. Have further reasons for these descriptors emerged over the past month? RM: The concept of The Most Beautiful Moment in Life, that was chapter one for us, it feels like that because we were starting from the bottom but on this concept, Love Yourself, we started to talk about some brighter things, like the real things in life. Professionally, we got on the Billboard and UK charts, and our stadiums are getting bigger... so both inside and outside, it’s a turning point for BTS. I’d like to say we’re just in a different universe now, I think, like a crab, we got a new shell. Two of the album’s most emotional moments are the hidden tracks, the spoken word ‘Skit: Hesitation & Fear’ and ‘Sea’. They both deal with struggles in your early days as well as current concerns about fame and success. Why was it important to have them on the same album? RM: We add hidden tracks when we want to add details, right? ‘Skit’ was necessary for ‘Sea’ to be explained. I think they’re reacting to each other. I actually first talked about those fears, happiness, the sea and the desert on our first album (2 Cool 4 Skool), they were the hidden tracks – a skit called ‘On The Start Line’ and a track called ‘Path’. Four years has passed and I’m talking about how we dealt with it, what is the sea and desert inside of us and what’s the future. You’ve come full circle and, damn, I didn’t realise. So over those four years, using this latest concept, what have you had to accept or learn to love about yourself that you didn’t like back then? RM: Ummm, I’ve had to accept that that everyone cannot love me. Because when there’s love there’s hate, when there’s light there’s dark. But it was really hard to accept as an artist that there’s a lot of people that hate me but, on the other side, there are many more people who love me. I think everyone goes through that. Do you recall when you were able to say, ok, I can deal with this? RM: Actually I’m still on the way (laughs). I don’t really feel like I’m really out of it, but I’m getting used to it. I’m like a surfer, first you just paddle and fall off the board but as time goes by you can stand up on the bigger waves (laughs). Themes of fate and destiny run through this album. Have you always believed you have a set path? RM: Nietzsche... one of his famous phrases was amor fati, or ‘love your fate’. Let’s say, me who is born in Korea, and you, Taylor who is born Australia, we can’t change that, we cannot have the same life. Amor fati isn’t just saying leave everything to fate, but to first accept things we can’t change. Love our fate, and our environment, then (think) we could do something with fate and turn directions. We’re on some path that’s set since we’re born, but I still believe we can change some things. So I believe in my faith but I still don’t believe in my fate (laughs). The huge success you’ve experienced off this album, how is that impacting your creativity? Can you think ‘I’m gonna write a song and see how it goes’, or it is ‘I have to write a song and it can’t be anything less than amazing’? RM: That is a pressure actually, I can’t say I don’t feel it. What’s happening is so much for me, and everything around BTS moves so fast, like making ten songs in half a year. Sometimes (it’s) too much, but I always remind myself of things back in 2007, I started this because I wanted to say something. There was a message inside me and I wanted to spread it as music, so when I’m in my studio writing I try to take it slow. I’m trying to take a deeper look, like what am I really trying to say? Except with people knocking on the door going, are you done yet, have you got a song for me? RM: (laughs) Ah yeah, that’s why people call it a deadline, cos you feel like you’re dead. ‘Mic Drop’, both song and performance, is already classic BTS. ‘My bag’s filled with trophies... / Haters are already giving up / My success is already so golden... / You’re rushing to run away.’ BTS have always stood up for themselves but what’s made this track integral to your new chapter? RM: Hitman Bang (the group’s CEO/producer) wanted us to let out anger and pain on this track but it was hard ’cos there isn’t any anger or jealousy left inside, I’m satisfied right now (laughs). I love our fans, so many miracles are happening every day. I have no time for the haters. I think this goes with why Her is a turning point for BTS and ‘Mic Drop’ (helps) say that – we drop the mic and chapter one is over. It’s a lot of fun. How many mics has Suga broken by throwing them down at the end of each performance? RM: (laughs) Oh, no not (the good ones) yet, we buy cheap ones from the market, karaoke ones that cost like $30. You’re clearly enjoying life right now but there’s darker emotions lurking on this album, so might we see more of those on the next one? RM: Those (emotions) are still inside, they’re not going away but they’re now a different shape. I think love isn’t just made up of happiness and compliments and light. Love includes scars, a little bit of hate and some dirty things inside us. RM: We do have darker emotions and sometimes we feel so heavy with these records and the articles and people going ‘Oh, you’re representing Korea, you’re, like, making Korea famous! !’, and every second we’re like ‘Thank you so much’, but, you know, I’m still just here in my small studio and I try to write some lyrics and that’s all I do. I’m still trying to deal with it. So what, outside of BTS, makes you happy? RM: Thank you for this question, not many people ask it! (long pause) I have no driver’s license, so I ride a bicycle beside the Han River. That’s what I really love because no one gives a damn about me for that moment. I feel so free. I also love to collect figures and watch a midnight movie ’cos I can watch it all alone and in the best seat. Do you have to wear hat, sunglasses, and a face mask to avoid being recognised? RM: I don’t wear a face mask, I just wear a hat because my hair is too colourful, it’s too shiny (laughs). Critics had a conversation online that centred around the possibility of BTS being nominated for a Grammy. It didn’t happen this year, but next year... you never know! How does that make you feel? RM: I’ve heard people are talking about it, I try to not think about it. If I start to expect something, I get disappointed. A Grammy is a whole other level, it’s a whole other world for us! If you guys won, you’d have to wear seriously waterproof makeup. RM: Of course. Everyone would cry. I think we’d have to prepare a waterproof suit as well. Maybe just wear plastic from head to toe. RM: (laughs) Yeah, we’d have wear a spacesuit or something. You’ve had a gruelling month’s schedule in Korea, plus two concerts in Japan for 80,000 fans – what’s still the hardest thing during that, and who keeps you sane? RM: Sleeping. No sleep makes a human into another human (laughs). Culturally, Koreans are used it, but still it’s really hard. We get used to but we can’t ever get used to it. J-Hope always tries to cheer us up and I’m so grateful. Actually I like to call him a new leader for the group. After being together for years, who in BTS can still surprise you? RM: V. His words are crazy and his English is crazy too. He makes new words and new grammar and he always surprises me. I feel like he’s quite good at English too because he can speak to everyone, he’s got confidence, he’s got the guts. They say when you learn a new language you can’t be afraid of making mistakes. RM: (sighs) I’m always afraid of making mistakes. I think I was born with that. I’ve always wondered what BTS do before an album drops, is there a ritual? RM: We gather in our living room, have a little drink and talk about how we should deal with the schedules and how we’re doing. It’s really nothing but it makes us feel different, it keeps us running and it keeps our attitude because we always remember when we were sad and poor (laughs). Popularity is a bubble. It’s a mountain, you can go up really hard but walk down really fast. Okay, last thing... you are the king of high fives and handshakes that go slightly wrong. RM: (laughs) Yeah, that’s what fans from Europe and America say! But they love those moments, right! It’s a cultural thing? I don’t know why, but no one pays attention to my handshakes and high fives. My hands are really big and I’m like six foot, so they can see me really easily. It’s very sad, isn’t it (laughs).